As Virginia football fans dissect the roster for the 2018 season, a pair of threads popped up on the message boards at TheSabre.com discussing the defense. Specifically, can the defense be better in 2018 since it is year three of the Bronco Mendenhall era? You can read those two threads here and here. While many posts in those threads focus on the loss of Micah Kiser, Quin Blanding, and Andrew Brown to the NFL, the individual level isn’t what interests me when talking about the defense and its chances of being “better” in 2018. Something else does. The “99 Virginia Football Thoughts Before Kickoff” series continues. If you’ve stuck it out through the leans years with UVA football over the last decade and continued reading articles like this one, some readers might remember a theme in some of my analysis articles. That theme focuses on the Hoos giving up explosive scoring plays to opponents and it dates back over five years now. At the end of the Mike London era, defensive coordinator Jon Tenuta liked an aggressive 4-3 scheme. It created disruption with sacks and potential turnovers, but the defense proved vulnerable to break-through scoring plays. Over Tenuta’s 36 games as the coordinator, the D gave up 41 touchdowns of 24 yards or more in 36 games. That’s an average of 1.14 long scoring plays per game. When Mendenhall took over in 2015, he overhauled the schemes to work out of 3-4 base with a lot of 3-3-5 looks through the first two years. Mendenhall also has dialed up blitzes somewhat frequently and that’s led to similar issues of allowing long scoring plays. Through 25 games, UVA has allowed 31 touchdowns of 25 yards or more on defense. That’s an average of 1.24 long scoring plays per game. The encouraging news is that the defense took a step forward in year two. After allowing 17 scoring plays of 25+ yards in 12 games in year one with just two clean games (1.42/game), the D gave up 14 in 13 games in year two with four clean games (1.08/game). So when any discussion focuses on whether the defense can be better in the third year of the Mendenhall era, that’s where I start. Can the defense have fewer breakdowns that lead to big scoring plays for opponents? There was a step in the right direction last season as noted above and this year’s defense has more overall experience despite losing some of its starpower. UVA features 11 players that have started at least three games and five players that have started nearly every game of Mendenhall’s tenure. The hope has to be that familiarity with the schemes and experience with reads leads to fewer miscues. A look at BYU over Mendenhall’s final five season in Provo provides some hope there. You have to cycle back all the way to the 2011 season to find a year where the defense gave up double-digit touchdowns of 25 years or more. The five-year rundown added up to 34 touchdowns of 25+ yards in 65 games or 0.52/game. If you take out the double-digit 2011 season, that falls to 23 in 52 games or 0.44/game. Taking the comparison one step further, you can see where improvement may materialize and it fits into one of the offseason targets for the coaching staff in general. Run defense. The coaches concentrated on improving the run defense in the spring to help the defense develop. That’s where the biggest difference occurred in explosive scoring plays allowed at Virginia vs. that five-year snapshot at BYU too. In fact, last season’s seven long passing touchdowns allowed matched up fairly well with the five final years in Provo. That’s not true with the rushing side of the equation. At UVA over the first two seasons with Mendenhall, the defense has allowed 13 rushing touchdowns of 25+ yards (.52/game). The Cougars didn’t allowed that many long rushing touchdowns in those five years combined, giving up 10 total in that time over 65 games (.15/game). In two different seasons, BYU didn’t give up any long rushing touchdowns at all. 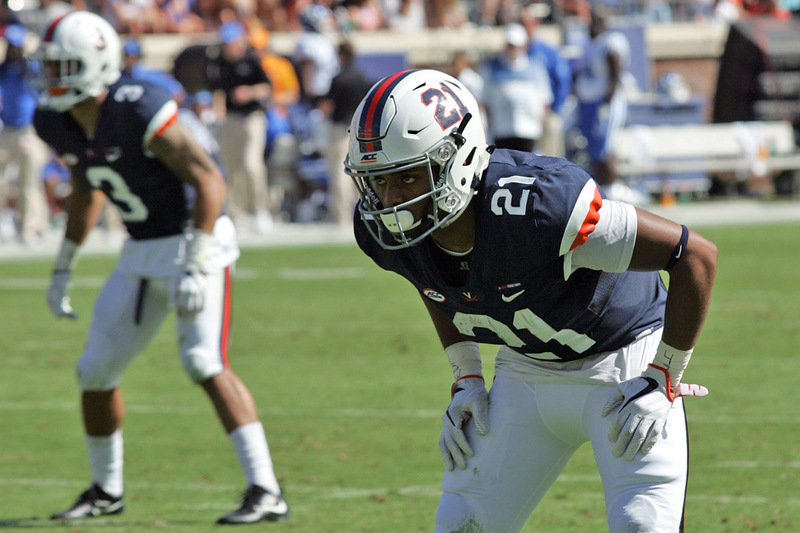 That’s a clear target for improvement if this year’s defense – or any UVA version in the years ahead – wants to be “better” than the first two years of the Mendenhall era. Excellent write-up have enjoyed the whole series and look for it each day. Another great article and I promise you that even with losing Blanding, Kiser and Brown, our defense will drop from giving up 28 points per game to around 22-23. Part of that will be because of cutting down the number of long TD runs. I was surprised they gave up that many last year because of Kiser and Blanding playing in the middle of the defense and many of those were when Blanding came up hard to stop the run and the ball carrier ran by him. Someone, has to always play center field so to speak to prevent things like that. The difference from his later years BYU defense to the first two years at UVA in this one area surprised me. I thought it would be better at BYU, but not as drastic as the numbers show.